In the past few days, Facebook have expanded on their like button with ‘Reactions’. 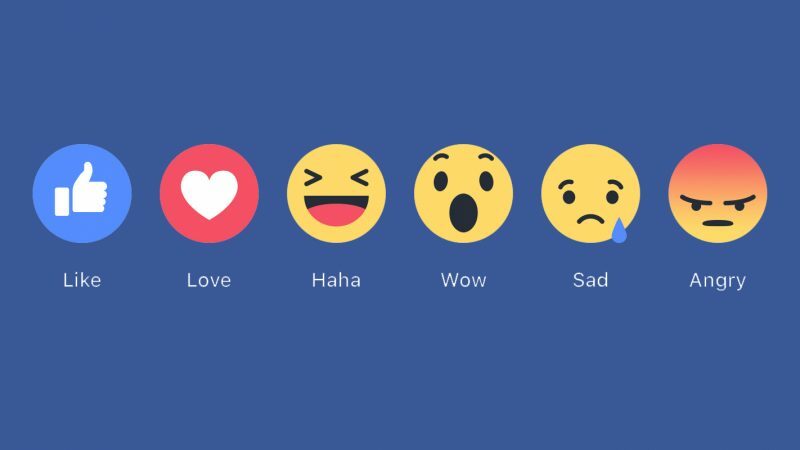 Facebook Reactions allows users to react with love, haha, wow, sad or angry to posts. We’ve known this was coming for a number of months now, but with very little lead-up hype, Facebook Reactions are here. From the initial beta testing we’ve lost the ‘yay’ reaction, but haven’t gained any new ones. You can ‘react’ to a post on desktop by hovering over the like button and clicking on one of the reactions from the dialog, while on mobile you press and hold the like button for the options to appear. There have been mixed ‘reactions’ to this new feature. One glaringly obvious element is it’s similarity to Slacks’ reactions, which is much broader and more mature, even allowing users to add their own reactions for their channel. Additionally, just 6 reactions probably isn’t enough to really sum up the spectrum human emotion, especially considering there are over 50 ‘feelings’ available to post. There are two in particular that seem to missing, ‘excited’ and ‘dislike’. None of these reactions can really sum up how excited I am about the upcoming twenty one pilots show, and there are some negative posts that sad and angry aren’t adequate for, one particular instance being a page being hacked and posting irrelevant junk every day, it doesn’t invoke anger or sadness, just disappointment. To rub salt into the wound of people still wanting the dislike button, Facebook’s algorithm treats all reactions as a like. So you can expect to see more of those triggering posts you reacted sad or angry to. Those matters aside, it’s a welcome, albeit belated, upgrade to the like button. Business pages in particular will benefit from the additional insight they will gain into their audience’s feelings towards what they share. It’s exciting to see what else Facebook might change as the year moves on, and I’m sure this is just the beginning for Facebook Reactions. You can read more about the launch of Facebook Reactions on the Facebook Newsroom.